Can Parker go to far? The poetry teacher Ms. Donnely has the amazing ability to not only reach her students, but help them out. Parker's pranks normally go off without a hitch, but whenever they don't Ms. Donnely always bails him out. Maybe in the Parker Lewis universe this week could be considered a 'bad week', but a lot of his schemes seem to backfire. Parker goes too far and Ms. Donnely finally calls it quits... Literally. 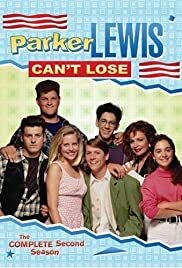 This episode is chocked full of little tidbits such as the one listed in the goofs about the "Parker Lewis Can't Lose" T-shirt. That and Parker and Mikey get roughed up at one point (basically involving their clothes getting switched). Sure enough through the rest of the episode you see Parker wearing Mikey's jacket and Mikey sporting one of Parker's trademark shirts. Not only does Parker risk an epic fight going down (Kubiac vs. McDonald), but Ms. Donnely's replacement is driving the class crazy. Without Ms. McDonald a lot of people risk getting beaten up! A climatic episode as everything culminates towards the end.